A slightly older story but a warning for us in New Zealand as we face the Food Bill being passed into law. A Vancouver Island farmer is fighting a bylaw that prevents him from selling the produce he grows on his residential property, saying farming should be unrestricted by laws. The District of Lantzville, located just north of Nanaimo, has threatened Dirk Becker with legal action unless he applies for a temporary use permit to farm. But Becker has refused, saying farming should be a right. Becker has been battling the district since last November, after a neighbour complained Becker was growing produce on his one-hectare residential lot, and selling it at a local farmers market which he founded several years ago. Becker, who also markets himself as a public speaker for social change, is an outspoken proponent for local and organic food production and sustainability. The district is working on a new bylaw that would allow for-profit farming on residential property, but in the meantime it's sent Becker a letter, threatening to take him to court unless he applies for a temporary permit. But Becker is refusing and has called on the district to withdraw its threat of legal action. "It's not operating in good faith that they're saying 'We're changing the bylaw, but we're going to prosecute you under the old bylaw,'" said Becker. He also wants the district to create a committee to review the proposed bylaw, which he says would still prevent him from growing enough food to make his business viable. Becker says two independent organizations have been created which agree with his point of view, and 500 letters of support have been received by the council. "So what's happened is more and more people have come to the realization that what Nicole and I are doing is very important and needs to not only be allowed, but appreciated and encouraged and protected and facilitated," he said. 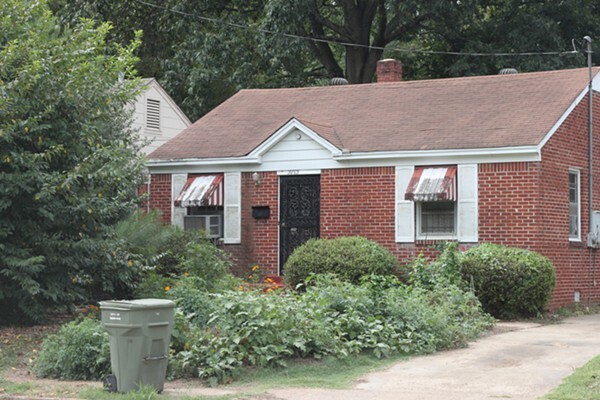 Lantzville Mayor Colin Halme was not available for comment, but in a statement posted on the District of Lantzville website in March, the mayor said the district was not opposed to urban farming but that it needs to develop policies that worked for everyone. "Although council has been receiving a variety of communications on the numerous benefits of local food production, there have also been concerns expressed as it relates to the increase of traffic, odour (stemming from the organic materials used in these instances), importation of foreign materials, potential contaminants, potential well contamination, water use and pests," said the statement. "Further, the question has been raised as to why intensive agricultural activities should be allowed within residential areas when there is significant agriculturally zoned properties that are not currently being used for agricultural activities," said the statement. We've been through this before. Remember the story earlier this summer about a Michigan mother who was facing 93 days in jail for planting a vegetable garden? 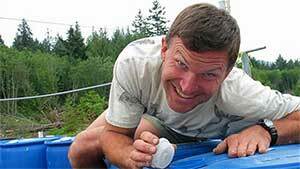 Or the ongoing story of a British Columbia man who is facing 6 months in jail for growing food? 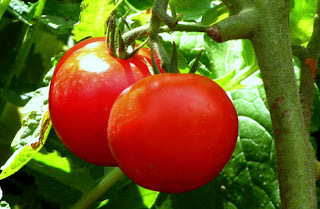 And the hundreds, if not thousands, of other gardeners who get harassed for doing nothing more than trying to live a more sustainable life; to have some connection with the food they eat in an era when shrink-wrapped, flavorless food reigns supreme. This has to stop. The future is bright for Adam Guerrero's garden. After a social media outcry to the tune of thousands of supporters, and even some national media attention, Guerrero's story moves toward a happy resolution: He will keep his front yard garden trimmed, install a bubbler and introduce mosquito-eating fish into his backyard pond, reduce the number of on-site worm bins, and install mesh covers on his rain barrels to keep mosquitoes out. This great interview with Jim Kunstler was done back in 2008. (Reuters) - Italy paid the highest yield on a 10-year bond since the introduction of the euro at an auction on Thursday, the first long-term sale since Standard and Poor's cut the country's sovereign ratings. Italy's funding costs remain under pressure despite a pick-up in risk appetite driven by expectations of a stronger euro zone rescue fund as analysts said the government's tentative reaction to the debt crisis had damaged investors' confidence. Although paying a high price, Italy managed to sell 7.86 billion euros of long-term bonds, reassuring markets on its funding abilities and moving closer to an overall issuance target of 430 billion euros for the current year. The 10-year yield rose to 5.86 percent at the auction, up from 5.22 percent a month ago. The bid-to-cover ratio was 1.374 compared to 1.269 in August. "That's eye-watering yield levels" for the 10-year bond, said David Schnautz, a rate strategist at Commerzbank. He said the yields were not yet at a level where they challenged the sustainability of Italy's 1.9 trillion euro debt pile, but added: "Obviously it's not a comfortable level on a sustained basis. Despite ECB intervention for more than one month Italy is still printing at these levels to get the paper out of the way." The European Central Bank started buying Italian and Spanish bonds at the beginning of August in a bid to protect the bloc's third- and fourth-largest economies from a spreading debt crisis. But the purchases have failed to put a lasting lid on borrowing costs. but at 366 basis points the spread between 10-year Italian BTPs and German Bunds is not far from the record high of 416 basis points it hit at the height of the crisis. Rome paid the most in three years at a short-term auction on Tuesday, the first debt sale since S&P cut Italy's ratings by one notch on September 20 citing poor growth prospects and damaging political uncertainty. Italy has benefited less than other euro zone peripheral peers such as Spain from improved risk sentiment as its fractious government is widely seen as too weak to push through unpopular reforms to boost the country's anemic growth rates. Here is an interesting email from reader "Kevin" regarding the crashing loan-shark market in China. I am a long time reader and want to bring to your attention on a new development in China: private business owners are disappearing or jumping off buildings because they can no longer pay off black market shark loans. According to national new paper Economics Information (part of state media Xinhua), on 9/22, Hu Fulin, owner of the biggest eyeglass manufacture of the city of Wenzhou disappeared, leaving behind 2 billion RMB debt. On 9/25, 3 more business owners in Wenzhou disappeared (owners of copper, steel and shoe manufacture). On 9/27, owner of "Zhengdeli", a shoe manufacture jumped off of a 22 story building and killed himself. Since April this year 29 private business owners have disappeared, all of them had over 100 million RMB businesses. 11 of the 29 owned shoe manufacturing businesses. The complete article is here (in Chinese): http://www.jjckb.cn/2011-09/29/content_334954.htm. Another article http://finance.sina.com.cn/roll/20110929/005910558780.shtml (titled: China's Shark Loans Crashing; "Grey Finance" Brewing the Chinese Crisis) states that most of those owners have borrowed "private" loans (typically 70% of all loans), with MONTHLY interest rate ranging from 3% to 10%. About 89% of families/individuals and 59% of companies in Wenzhou participated in such "private loan" schemes. In Erdos (the ghost city you blogged many times), such "private loans" are more than 200 billion RMB with annual interest rate over 60%. Now they are crashing, causing rampant unfinished real estate projects in Erdos. "Economic Information Daily" correspondent from the multi-confirmed the day before and then there were two causes of Wenzhou City, inability to repay loan sharks and jumping events. According to informed sources, the two business owners are the local shoe factory owner, debt of millions. Since April this year, Wenzhou, missing more than 80 business owners, the company closed, the event staff pay talks, since September alone, there are up to 25 cases. A local lender told reporters, "At present, only the flight of capital Longwan area estimated to have 100 million or more, many SMEs liabilities, the banks accounted for 30%, accounting for 70% civil usury." Some sharks can reach up to 180% per annum. ... "many companies debt snowball, private lending market has not been given attention now has about 25% local to 30% of companies in trouble, some in the suspension or semi-shutdown state, but by the end of this class companies are more likely accounted for 40% to 50%. " Also courtesy of Google Translate, please consider loan-sharking business owners who jumped to escape. September 22, Wenzhou, Zhejiang Jiang Xintai largest optical company chairman Hu Fulin liabilities 2 billion fled, triggering a major earthquake Wenzhou business. Wenzhou Zhou German SME Development Association president, said Hu Fulin liabilities involving nearly ten thousand people, dozens of companies, including upstream and downstream Nobuyasu and creditors, the incident is still fermenting, the impact will be further expanded. Hu Fulin fled after the September 25 Wenzhou enterprises have three big boss fled; afternoon of September 27, Wenzhou shoe boss is profit because of debt problems from Wenzhou Shun Building, 22 Floor, Jin jumped to death. The translations are choppy, but the ideas very easy to spot. 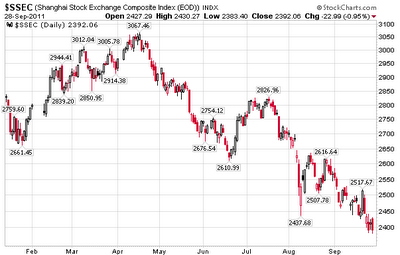 China is down another 1% (not reflected in the above chart), to 2368 as of 2:00 AM Thursday. It closed at 2365. 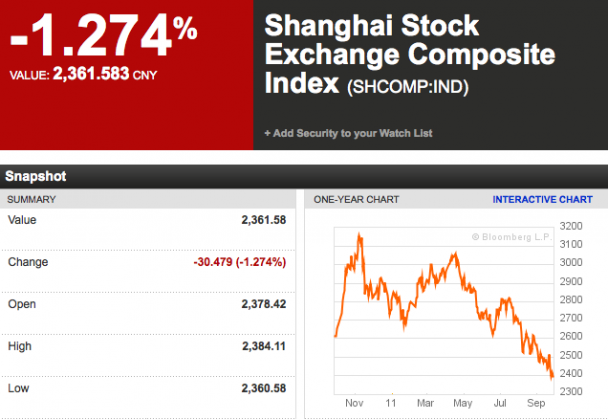 The Shanghai stock market depicts a credit bubble that collapsed in 2008, partially rebounded, and is sinking once again. China did not decouple from the global economy, nor is there any reason to believe it will, or should. China's debt bubble, housing bubble, and copper Ponzi financing schemes are collapsing. BEIJING—Rapidly rising wages in China have reached the point at which foreign manufacturers need to give up on the notion of the country as a low-cost production base, a senior Hyundai Motor Co. executive said Thursday. Jae-Man Noh, head of Hyundai's joint-venture operations in China, said average manufacturing-worker wages in China—about 27,000 yuan ($4,200) a year per worker in 2009—are likely to double by 2015 from current levels. Auto makers are expected to be affected as much as other industries by the trend, if not more, Mr. Noh said, adding that wage costs for many foreign auto manufacturers already have doubled in less than a decade. He said that a rival foreign auto maker that Hyundai has researched has seen worker wages in China rise to 49,000 yuan a year per worker in 2010, up from 24,500 yuan a year in 2003. "We need to let go of our perception that the Chinese market is a low-cost production base," Mr. Noh told a group of reporters at Hyundai's office in Beijing. He didn't offer specifics on Hyundai's wage costs in China. This is one of those classic programs that helps to explain everything. Max and Stacy talk about the infamous “trader”, Alessio Rastani and bring a lot of light to what the banks are up to. They have a great deal of fun as they do so! Is America Becoming Spiritually Poor? Several Native American tribes tell a story about an old woman who wanders the roads of life with her grandson. For unexplained reasons, they are poor and hungry, caught in the winds of fate without food and shelter. They arrive at a village where people are busy with preparations for a great feast. The old grandmother knocks on doors and asks for food for herself and her grandson. Despite the evident abundance, they are refused entrance. She is rebuked for interfering with the big feast and for distracting people from their tasks and efforts. The old woman and child trudge along and enter a poor village where people barely have food to eat. Despite, and because, of the poverty there, they are invited to share in a communal soup that is mostly water. The old woman commends the people for inviting them to the table and adds some crystals from her pocket to the soup. Surprisingly, the thin gruel takes on a rich flavor that satisfies everyone. A story like this persists because it has many levels of meaning. On one level, it reminds people that hunger and poverty can happen to anyone, young or old. It also depicts a common human fault wherein those who have more than they need often feel too busy and self-satisfied to give to those in greater need. Meanwhile, those who understand the effects of poverty and loss often feel compelled to share what little they have. Thus, a deeper kind of poverty becomes revealed. Those unwilling to share with others in times of need display a spiritual poverty that overvalues material possessions while conveniently undervaluing the sufferings of those less fortunate. The point here isn’t simply moralistic; but more that life ceases to flow and can lose its flavor when people simply hold onto what they have received. A great feast can be bland and can fail to satisfy one’s genuine hunger for a taste of the essence of life. For life to have real flavor, something salty and genuine is needed. Salt is whatever can cut through the false pretenses and superficial levels in order to bring out the deeper feelings and essential elements that make the shared experiences of life meaningful, satisfying and memorable. The story of salt tends to be told when people are fiercely at odds and worried about survival. 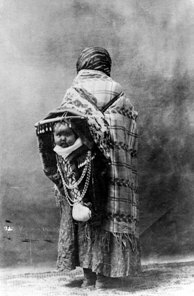 The old salt woman represents those who are the “salt of the earth,” the ones with enough heart to protect and care for others, especially the young. She represents the elders who are supposed to add the salt of experience and wisdom to the daily soup of existence. For the elders know the danger of allowing the disparity between the village of the “haves” and the village of the “have-nots” to grow too great. Modern disparity studies show that too great a gulf between the rich and the poor contributes to the overall of anxiety in a culture. Excessive disparity also increases the rates of serious illness and surprisingly does so at all economic levels of a culture. At some level we are all in the same soup. Those who refuse to understand this tend to lose the real flavor of life even if they rise to the top or win some elections. Too great a divide between those more fortunate and those less wealthy specifically endangers the children. The new report on poverty in America shows more and more people falling into hunger with the greatest increase in poverty found amongst children. While people argue over issues of national security and the viability of social security, the basic levels of cultural insecurity are growing and the most vulnerable are increasingly being refused entrance to the feast of life. Something has gone very wrong when those old enough to know better wind up cheering for the misfortune of others and voting for abstract ideas that lack an understanding of human suffering as well as the salt of wisdom. The elders are supposed to be “worth their salt.” They are supposed to be able to add the salt of wisdom to the soup of civilization. And, they are supposed to recognize the essential vulnerability of all children as well as the need for meaningful opportunities for all young people. It is no accident that the one who holds and protects vulnerable children and helps bring people together is an older woman. Traditional cultures often had meaningful roles for women beyond the age of child-rearing. The original meaning of grandparent goes far beyond the simple sense of a biological predecessor or the issues of a family inheritance. The grand mother imagined and worked for the well being of all the children and she had enough salt to speak truth to power. Grandparents become truly grand, not by simply having grandchildren, but by learning to see the inner grandness in each child. Grandparents are those who take on the responsibility for sustaining the grandness of the dream of life. Someone old enough to become a grandparent should be wise enough to see the big picture; and the big picture always involves more than simple survival, just as the deepest problems we face are never simply economic. Those who trade in politics and economics often become caught in short-term solutions and self-preserving strategies. However, the old notion of the elders did not involve an elected position; rather it is a soulful condition that can bypass local politics as well as national pretenses in order to preserve life and dignity for the greatest number of people. Sometimes “it’s the economy, stupid” and sometimes it is stupid and foolish and cowardly to pretend that the economy is all that matters. More and more children are growing up in the village of hunger and poverty; more and more young people cannot find a job, much less a career opportunity. Those aren’t signs of an economic downturn; they are indications of a loss of grandness and a failure of human courage. While people argue about which faction gets how much of the national pie, the grandness of the underlying dream of America becomes increasingly tarnished and diminished. In the end, we are each others’ security. The bigger question may be whether or not the grandmothers and grandfathers of the current generation can find enough salt to insist that human decency and honest compassion be exercised for the benefit of all before the next round of uninspired political fighting occurs? In the end, a culture is not measured by its gross national product, but by the way it treats those who are most vulnerable and most in need. 1,000 + people marched through NYC and many were arrested. the crowd at the park grows each day. If you have not heard from your friends lately ... maybe they're there. “I look at the economic stories out of Europe today and they are all so... vacuous. They say little except that, behind the scenes, the book cooking and the corralling of financial players continues. Rumors are still driving rallies while all of the un-addressed fundamentals remain as un-fixable as ever. It will never be possible to achieve enough growth to repay these astronomical debts. Today's stories are back to focusing on seedling trees while missing the enormity of the forest. This is all being dragged out over the short term. "Until what or when? ", you ask. But everything that is happening continues to tie as many elements of the European and global economies together, making sure that Japan, the BRICs, the U.S. and even China are sitting in the same sinking boat. 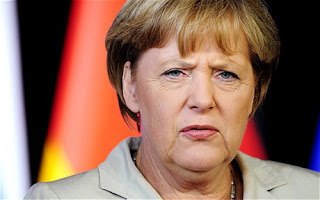 Angela Merkel has successfully corralled her government into voting for the revamped euro bailout fund, asserting her authority as chancellor by pushing through the bill without needing to rely on opposition help. Of 611 MPs present in a highly-charged sitting at the Bundestag on Thursday morning, 523 voted in favour of expanding the powers of the European Financial Stability Facility (EFSF). 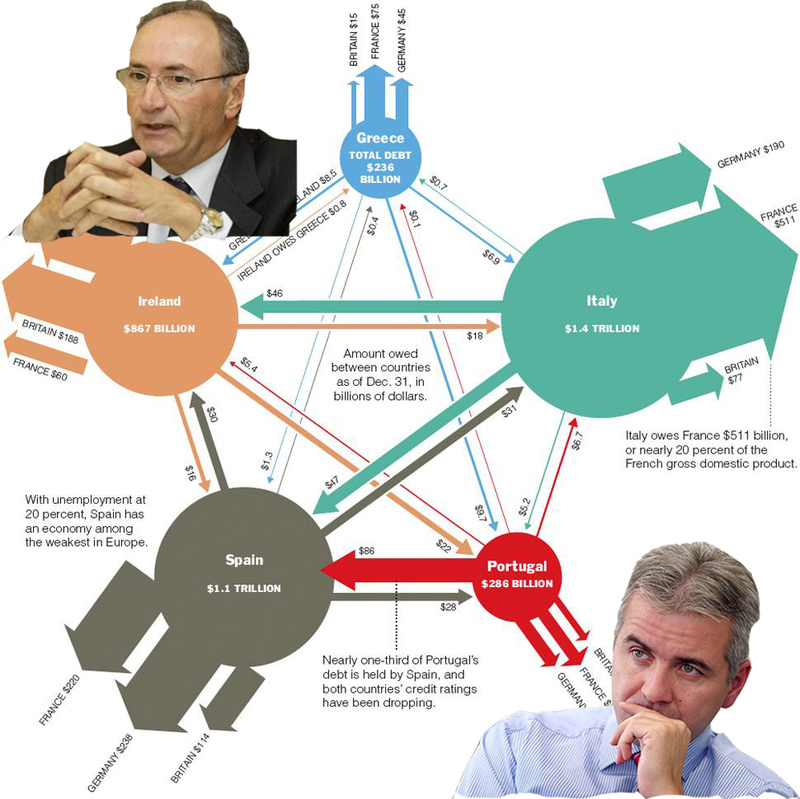 Under the plan, the EFSF will be enlarged to €440bn (£382bn). It will also be given the ability to give "precautionary loans" to struggling European countries, buy EU government debt, and provide funding to shore up the capital reserves of European banks. The result was a triumph for Germany's shaky coalition government and marked a major step towards tackling the eurozone's sprawling sovereign debt crisis. Some analysts, though, argue that more radical measures will be needed. Another short-term, just in-time agreement! Funding for six days! Is this preparation for sonething much bigger? Washington (CNN) -- A short-term spending measure to fund the federal government into next week won approval Thursday from the U.S. House and now goes to President Barack Obama's desk. The measure was part of a bipartisan agreement intended to end a dispute over disaster relief spending that threatened to cause a partial shutdown of the government when the current fiscal year ends at midnight Friday. Congressional approval of the measure keeps the government funded through October 4. The House will then have to consider a more comprehensive measure that would keep the government funded through November 18. With most House members away from Washington on a one-week recess, Thursday's approval took place at a "pro forma" session involving just three House members using a procedure known as "unanimous consent." Cash Crunch in China Picks Up Momentum; Chinese Economy "Teetering On the Edge"
Perhaps John Key when looks to China for salvation should have a closer look at this? Todd Martin, an Asia equity strategist at Societe General SA, talks about the outlook for China's economy and credit market. Martin also discusses global stocks and commodities. He speaks with Rishaad Salamat on Bloomberg Television's "On the Move Asia." The interview starts off with a very weak idea "fundamentals have been thrown out the window". However the analysis gets much better as the video progresses. Here are a few key ideas from Todd Martin. • RMB offshore vs. onshore rate is at a historic low. This shows Hong Kong or China mainlanders are hoarding cash, possibly to repay debts. • The liquidation phase is concerning. Markets are looking into a deflationary abyss. • Recent capital inflows into China are misleading. It was not investment but rather mainland money repatriated to repay debt. • Cash crunch in China picks up momentum. We are going into a new down phase and true credit cycle in China. That can take on a life of its own. Rishaad Salamat: "Are you saying at the moment that the Chinese economy is teetering on the edge as a consequence of all this?" Todd Martin: "It's beginning to look like that. There are signals that there is a cash crunch and it is picking up momentum. 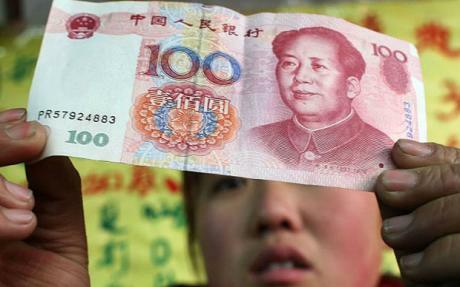 The offshore RMB market for one. The repatriation of capital for two. This could cascade into a property correction. Once that gets going, you could probably get a lot of sellers jumping into the market." Rishaad Salamat: Is commodities the worst asset class to be in, at the moment? 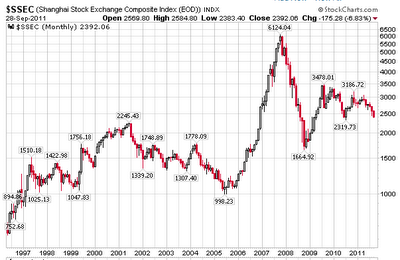 Todd Martin: "Commodities is probability the worst asset class to get hit. If you are in a business seeing input prices fall and you have some pricing power downstream, then you could come out OK. Steel prices are still falling faster than iron ore, so that is still not one to be in yet. It's pretty bloody. We are withing 15% of the bottom but the credit cycle concerns me." I disagree with Martin about the fundamentals. I think fundamentals on China are horrible. I have been bearish on commodities because China is overheating at a time global demand from Europe and the US will collapse. For further discussion, please see Michael Pettis: Long-Term Outlook for China, Europe, and the World; 12 Global Predictions written August 22. Hopping into commodities or commodity-related currencies with a strengthening US dollar, falling global demand, a potential breakup of the Eurozone, a default by Greece, etc, was a poor investment idea. Please see the link for a very nice discussion of 12 detailed ideas for the global economy. This is what I said on August 22, in response to the ideas of Pettis. China did not decouple in 2008 (except perhaps in reverse), and it will not be immune from this global slowdown either. China, which has suddenly become a chief concern for world markets, continues to look sick. At least from the perspective of domestic markets. The Shanghai Composite, which has already lost about a third of its value since late last year, is sliding once again. "If all else fails 'go to war'"
The world is going to find 53% more energy?! Think that China is immune to economic breakdown? China to quit US debt?